According to some measure, real estate prices just recorded their biggest annual gain since 2006 and surveys show that Americans’ confidence in real estate is growing. Contrarians may consider this to be bearish, but one leading indicator doesn’t. 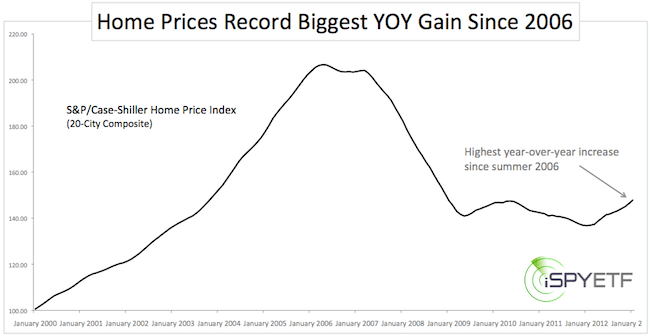 The S&P/Case-Shiller Home Price Index has become an important gauge of the real estate market. Index levels are updated on the last Tuesday of every month (that was yesterday). The January data (the index uses a 3-month average and is published with a 2-month lag) showed a 0.1% month-over-month and an 8.1% year-over-year increase for the 20-city composite. The YOY figure was the biggest jump since the summer of 2006. Compared to what we’ve gotten used to, this sounds grandiose. The first chart below puts last year’s gain into perspective. Although it looks less earth shattering, the increase is respectable. Forward-looking investment decisions aren’t based on rearview mirror-focused analysis, so what’s next for the real estate sector? 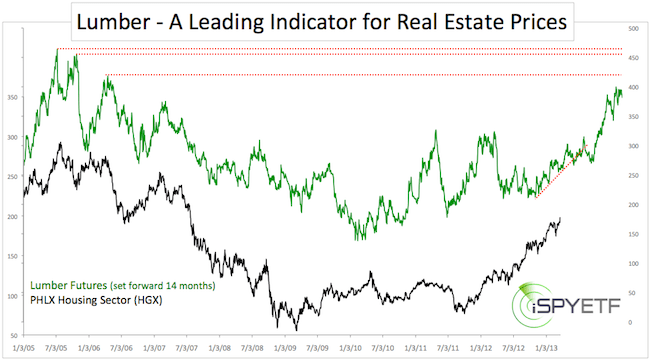 In the October article “Is the Real Estate Recovery Here to Stay?” I introduced a quirky but credible leading indicator for real estate prices – lumber prices. Lumber is a key component for every house, therefore seeing the connection between the raw material (lumber) and finished product (house) isn’t much of a stretch. The October article plotted lumber prices set forward by one year against the PHLX Housing Sector Index and highlighted the correlation between major tops and bottoms (something we won’t do today). Our conclusion, based on the leading lumber prices indicator, was that the housing recovery would last at least into mid-2013. Why 2013? Because lumber broke through trend line support. At the time we didn’t know if this would end the lumber rally or not. Today we know that lumber prices recovered and soared on to new recovery highs. The October article noted that the correlation between lumber and real estate prices might be even better if lumber prices are set forward by more than 12 months. The chart below does just that. It plots the PHLX Housing Sector Index against lumber prices set forward by 14 months. Obviously, the strong rally in lumber prices bodes well for real estate prices and real estate ETFs like the iShares Dow Jones US Real Estate ETF (IYR) or Vanguard REIT ETF (VNQ). This indicator allows us to peek ahead a year or so and no further. The lumber rally has slowed as of late and various resistance levels (dashed red lines) are not far away. It is possible that the real estate rally will run out of steam in mid-2014. If that’s the case, lumber prices will be our canary in the mine. Gold measured in US dollars has been treading water, but gold measured in euro just staged a bullish technical breakout. While this is good news, there’s reason to be cautious of another ‘shakeout’ move for gold prices. Investors are forgetful and the market is relentless. The Cypriot Bailout was another reminder about gold’s safe haven advantages over fiat currency. In times past, gold would have soared on similar economic scares. But not this time. Gold today trades around the same level as two weeks ago. While the Cypriot Bailout failed to deliver the fuel needed for higher targets, gold could be getting a positive boost from elsewhere. Gold prices measured in euros just staged a technical breakout above resistance (red circle). Gold measured in US dollars is trading well below similar resistance. The red lines in the chart below mark previous times where euro-Gold broke above resistance. Euro-gold proved to be the bullish canary every time. 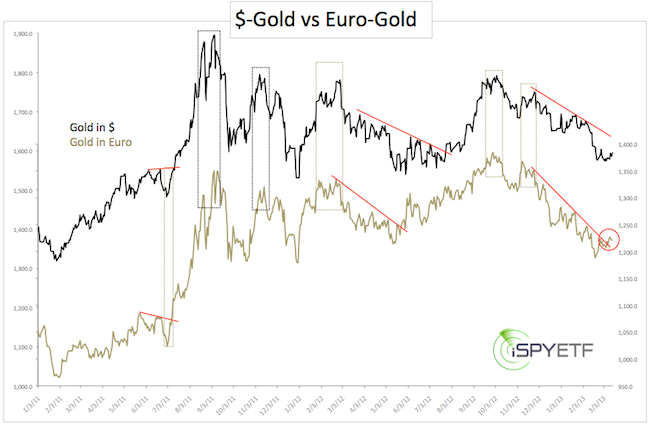 Price divergences between euro and dollar-Gold appear frequent at different degrees. The dotted boxes highlight some of the price divergences at larger turning points. More often than not, the euro pattern (gold colored boxes) sets the stage for the next move. Based on the correlation between euro-and dollar-gold prices, higher prices seem likely (sentiment is sending the same message). One reason I would like to see a new low is the lack of an obvious bullish price/RSI divergence at the February 21 low (@1,555). There was a minor divergence, but the bigger the divergence, the bigger the confidence in the longevity of the bottom. Over the past week gold prices have struggled to move past Fibonacci resistance. 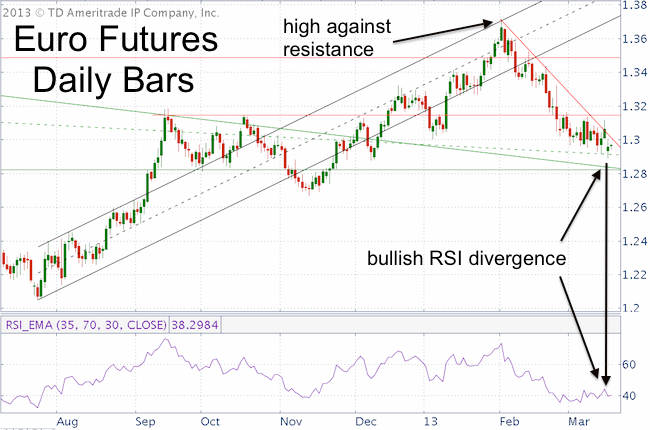 The reluctance to move beyond resistance (despite the ‘fear catalyst’ from Cyprus) and the lack of an obvious RSI divergence at the recent low, conflict with the bullish breakout of euro-Gold. Since I’m always looking for low-risk entry points, buying gold at lower prices would represent a much more attractive risk/reward ratio. Long gold ETF options include the SPDR Gold Shares (GLD) and iShares Gold Trust (IAU). The cat is out of the bag. Everyone knows that AAPL prices are no longer linked to iPhone, iPad or other iGadget sales. To the frustration of Wall Street, AAPL has developed a mind of its own. Here’s one simple trick that foreshadowed all turns since November 2012. Is Apple’s decline over? Much has been written about Apple’s quick demise from darling of the masses to giant under achiever. Charted below is AAPL on a log scale along with RSI (Relative Strength Index) and some powerful support/resistance levels. Apple’s decline from the September high has been confined to a well-defined parallel trend channel. Every instance Apple hit that channel is marked with a gray circle. There are six circles, so AAPL must consider this channel to be important. This week AAPL touched the upper channel line for three consecutive days but has so far failed to break above it. At the same time, RSI has come back to test resistance at 51, a level that rebuffed all prior rallies since October. There is a silver lining for AAPL bulls. 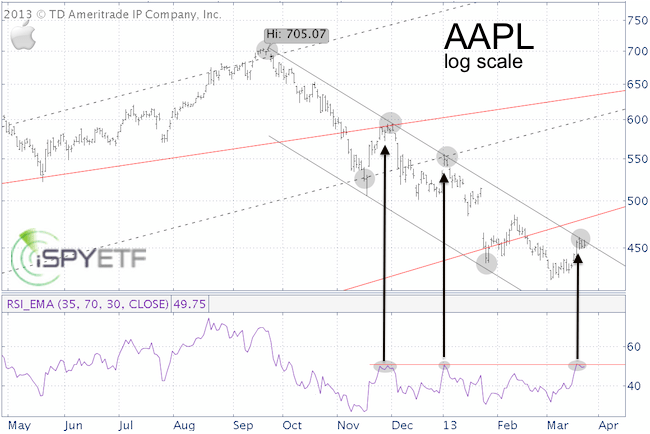 On the regular (non log scale) chart, AAPL already moved above its parallel channel. Nevertheless, the down trend deserves the benefit of the doubt as long as AAPL fails to bust through price and RSI resistance. Regardless of your bias, what AAPL reaction to current resistance will likely set the directional trend for the coming weeks. The trend channel can be used to find low-risk entry points and to manage risk. The lower ascending red trend line goes back to the year 2000. The dashed gray channel goes back to May 2010 and the upper ascending red trend line originates in 2003. All those long-term support resistance levels have been helpful in anticipating important turns, particularly the all-time high above 700. Thanks to quantitative easing (QE) stocks are up 130% and more. The Fed created a monster of a rally, but how do you tame the monster without killing it? As the most recent Fed minutes indicated, it may be ‘easier’ than some think. Never under estimate the psychological power of a dangling carrot. For years the Federal Reserve used the promise of more QE as an incentive (carrot) to drive stocks higher. This has worked well. Too well. The Dow Jones, Russell 2000 and other major indexes are trading at all time highs and the Fed’s next challenge is to tame the monster (rally) it created without killing it. How can this be done? Perhaps with the ‘reverse dangling carrot approach.’ Before we talk about the reverse carrot approach, let’s review how the ‘dangling carrot approach’ works. At how many post FOMC meeting conferences did we hear Ben Bernanke assure Wall Street that the Federal Reserve is ready and willing to assist? The placebo QE effect was strong enough to lift the S&P 18% before QE2 became official on November 2, 2011. Thereafter the S&P 500 rallied another 16% to the April 2011 high. QE2 ended in June 2011. From October 2011 – September 2012 the Fed did nothing more than dangle the QE3 hopium carrot and the S&P 500 rallied 36%. QE3 was finally announced in September 2012, followed by “QE4” (replacement of Operation Twist by outright Treasury purchases). 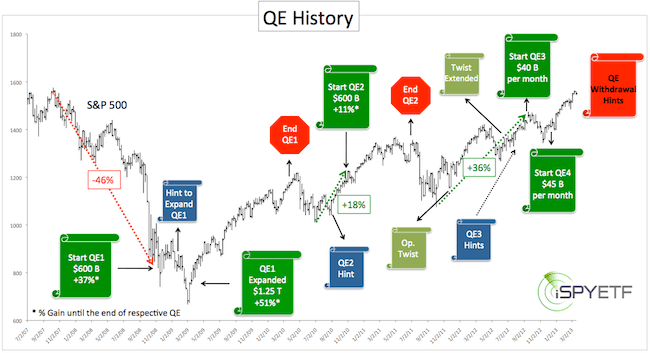 From 2009 – 2012 the Fed talked up QE and stocks. Today the S&P 500 trades 135% above its 2009 low and the Fed knows it created a monster (rally). The Fed also knows that everyone else knows this is a phony funny money rally. How can the Fed contain the monster it created – take away the punchbowl without causing a severe hangover. The ‘reverse dangling carrot approach’ is born. Dropping hints about more QE contained the bear market, so dropping hints about reducing QE should tame the QE bull market. This process may have already begun. The release of the Fed minutes on February 20, showed dissention among committee members about the duration and scope of QE. Whether this division over the issue is real or just a new PR strategy to contain the Fed monster, I do not know. But we do know that stocks sold off right after the Fed minutes were released. Just like controlled fires can stimulate a forest, the Fed may try to light ‘controlled burns’ to manage the stock market. As in nature, the summer time (starting in May) is a good time for a ‘controlled burn’ on Wall Street. Shareholders should plan accordingly. I personally view the Fed like an unwelcome guest. Some guests bring happiness wherever they go. Some (like the Fed), whenever they go. Unfortunately, the Fed’s comment about leaving (scaling back QE) appear to be only a tease. ‘Bad News Europe’ is back in the headlines and the euro is trading at a three and a half month low. European contagion concerns appear to be bearish for the euro currency, but technical analysis provides a different outlook. Negative European news just made their first media appearance of 2013 and the prospect of a Cypriot bailout sent the euro currency to the lowest level since December 10, 2012. Renewed concerns about the euro zone sound bearish for the euro, but technical analysis suggests the euro currency is ripe for a (temporary) comeback. The chart below tracks the euro since the July 2012 low. It also shows some of the trend lines and support/resistance levels the Profit Radar Report uses to pinpoint highs/lows and reversals. The euro has fallen precipitously since. Today’s drop created a green candle low which was unconfirmed by RSI – a bullish RSI divergence. A bullish RSI divergence in itself doesn’t mean the euro won’t fall any further, but two multi-year support levels (solid and dashed green line) suggest that the down side for the euro should be limited. The CurrencyShares Euro Trust (FXE) is a currency ETF that tracks the euro currency closely and provides easily accessible long exposure to the euro. A word of caution, it appears that the upcoming euro rally will only retrace a portion of the previously lost points and may not reach new recovery highs. We also note that the euro dropped to a new multi-month low, while the US dollar didn’t eclipse last weeks high. I’m not sure what this divergence means, but it’s reason to take a cautious approach. Regardless of this divergence and the next moves longevity, simple RSI and support/resistance level analysis like this identifies low-risk trade set ups and the risk management levels needed to spot an attractive risk/reward ratio trade. The Profit Radar Report analyzes the S&P 500, euro, dollar, gold, silver, Treasuries and other indexes/ETFs to provide low-risk and high probability trade setups. Financials are the second most important industry sector of the S&P 500 Index. Right now the Financial Select Sector SPDR ETF (XLF) sports a curious correlation to an economic indicator, along with some directional clues. Since 2007, the financial sector has tracked consumer sentiment closer than any other sector. The chart below plots the Financial Select Sector SPDR ETF (XLF) against the Thomson/Reuters University of Michigan Consumer Sentiment Index. Consumers aren’t nearly as confident now as they were in 2007 and the financial sector is far away from its 2007 high. 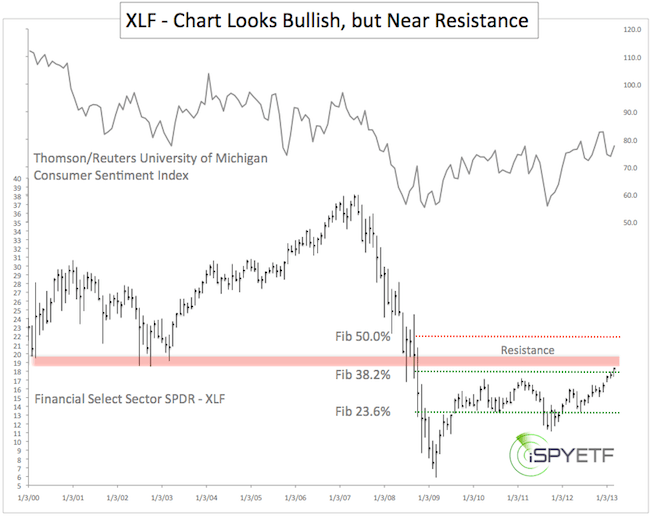 The comparison between consumer sentiment and XLF is more of anecdotal than predictive value, but the chart of XLF does provide some technical nuggets. XLF is now trading above Fibonacci resistance at 18.21. This Fibonacci level corresponds to a 38.2% retracement of the points lost from 2007 – 2009. The move above Fibonacci resistance is bullish and resistance now becomes support. However, a resistance level made up of several lows reached in 2000, 2002, and 2003 is immediately ahead at 18.52 – 19.66. Financials, as with the rest of the market, have enjoyed an incredible run, but investors have come to love financials a bit too much. The combination of sentiment extremes and upcoming resistance suggests that some type of correction is not far away. However, the correction may be more on the shallow side. Watch Fibonacci and trend line support for more clues. The Dow Jones just extended its run to the longest rally in over 16 years. Common sense would suggest that ‘what goes up must come down,’ but prior instances of prolonged and overextended rallies paint a different technical picture. If you like superlatives, 2013 is your year. After edging out another gain on Wednesday, the Dow Jones closed higher for the 9th consecutive trading day. This is the longest such streak since November 1996. Now, stocks are overbought, volume is waning and RSI is lagging. How Bearish is this for the stock market? How have stocks done after previous 9-day winning streaks? The sample size for 9 consecutive up closes is extremely small. There’s only one since 1996. To get a larger sample size and better read, we’ll look at recent times the Dow closed higher for 7 or 8 days in a row. 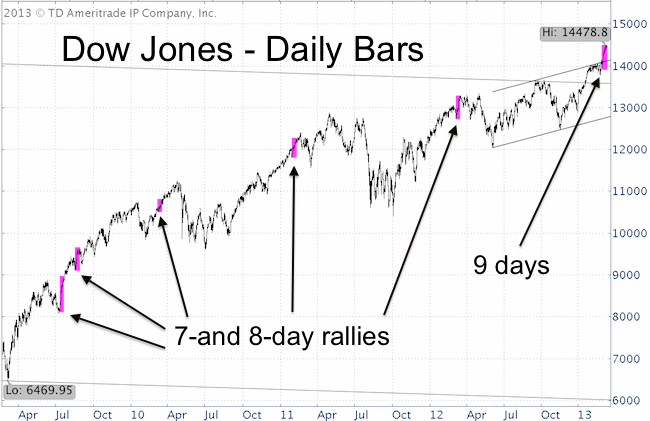 The chart below highlights all 7-and 8 consecutive day up closes since the 2009 low. There are two 7-day streaks (July 2009, March 2007) and three 8-day streaks (August 2009, March 2010, February 2011) and of course this year’s 9-day streak (March 2013). Every 7-or 8-day run was followed by at least one more short-term high within the next two trading days (twice the very next day, followed by marginally lower prices). In July 2009 and February 2011 the Dow just kept trucking higher. In August 2009 and March 2012 the Dow corrected approximately 4% within days after the streak ended. Somewhat bigger corrections (up to 10%) were seen about a month after the February 2011 and March 2012 streak highs. All losses were eventually recovered. It is interesting to note that 3 of the 6 runs occurred in March and (one more happened in February), so March momentum runs are nothing unusual. The gray/black trend lines in the above chart show important resistance levels, that once broken led the extended rallies (resistance levels were outlined in the Profit Radar Report). To sum up, the Dow is ripe for a correction, but any correction is likely to draw in enough buyers to bid up prices to new all-time highs. Since history doesn’t always repeat itself, it’s important to watch key support levels and become defensive if they are broken.